This is the reverse of the leaflet. 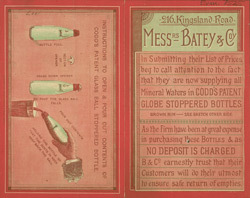 This is an advertisement for Messers Batey & Co.’s bottled mineral water. Water was sold in bottles for the first time in the 19th century. As can be seen from this leaflet they were sold in bottles called ‘codds’. These bottles had long necks and marbles were inserted into the opening to act as stoppers to keep the drink fresh. These bottles were popular with children who would smash the bottles to get to the marbles. They also gave rise to the expression ‘Coddswallop’. It was thought very uncouth to drink alcohol, particularly beer, from these bottles and people made disparaging comments about the beer being a ‘load of old coddswallop’, wallop being a slang word for beer.